lower right: E. Johnson / Aug. 29 - 74. (Hirsch & Adler Galleries, New York); sold September 1974 to Paul Mellon [1907-1999], Upperville, Virginia; bequest 1999 to NGA, with life interest to Mrs. Mellon; life interest released 2012. American Light: The Luminist Movement 1850-1875, National Gallery of Art, 1980, p. 49, 146, 208, repro. plate 32. Di Curcio, Robert A. 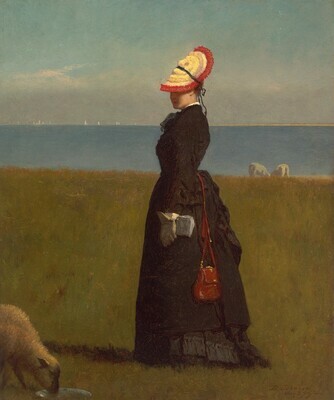 Art on Nantucket: The History of Painting on Nantucket Island. Nantucket, Massachusetts, 1982: no. 166, repro. Carbone, Teresa A., and Patricia Hills. Eastman Johnson: Painting America. New York: Brooklyn Museum of Art, 1999, p. 212, no. 16.